Editor’s Note: This piece is part of the content we teach in the CMX 6-Week Online Training program. Sign up now to go more in depth on this framework and many more. It’s a big question, one that people have been trying to answer for decades. Many books have been published, studies conducted, debates had, all on the subject of how communities are formed and fostered. At CMX, we spend every day thinking about this question. Community can feel like a very nebulous, emotional thing. Often community professionals find themselves just creating content, hosting events, and doing all the work without truly understanding how it all fits together. That’s why we developed a simple model to make sense of it all and to help you put a clear content and programming plan in place. We wanted to simplify the process so that anyone can understand how to build a thriving community. This model was developed based on our experience building communities and advising organizations over the last 10 years and builds on the concepts presented in some of the leading community psychology theories, which you’ll see referenced throughout this article. The cycle you see here is presented from the perspective of the community member. If you can understand how an individual member experiences a community, then you can create community content and programming to strengthen that experience. How do you move a member up these three levels? Let’s do a brief overview of the four stages of the Community Engagement Cycle that will move the member through each of these levels. The member’s identity aligns with the identity of the community. At the heart of community is identity. When someone decides to join a new community, they consciously or subconsciously decide that some aspect of their personal identity is aligned with the collective identity of a community. After they join, over time, the identity of the individual member will start to conform to the identity of the community more and more, if they become more deeply engaged. Our goal as community builders is to create a strong community identity that appeals to new members. Over time it will becomes a part of the member’s personal identity. Arielle joins the Yelp community and has an aspiration to identify as a “tastemaker”, being the person who knows about all the cool spots. Ultimately she becomes a power member of the community and identifies as a “Yelp Elite” member. Bart is an environmentalist and identifies with a subreddit community focused on that subject. Eventually he grows as a member of the community, launches a subreddit specifically focused on deforestation and identifies as a moderator in the reddit community. Doug learned about the Harley Davidson community and their identity appeals to him. He decides to buy a bike. Eventually he becomes a power member of his local Harley Owner’s Group and identifies as a leader, organizing rides for the local community. The member develops trust in other members and in the community as a whole. Both must exist in a strong community, and they fuel each other. So when someone is first presented with the opportunity to participate in your community, they have to trust that they will actually get value from participating. That trust comes from the reputation of the community, or from existing trust in members they have a relationship with. So if you’re organizing a brand new community without a reputation, the only way to get people to participate is to develop personal trust with them yourself, or to leverage the trust your existing members have with other members. That’s why it’s so important to start small, and do a lot of personal outreach when first launching a community. Only after your community is established will it develop its own reputation to create that trust. Arielle decides to participate on Yelp because she has a friend who’s really active on the platform. Over time as she participates more, she gets to know other members, whom she now trusts and who trust her. She also develops trust in the community and trusts that other members and the leadership team are listening to her needs and opinions. Bart decides to join reddit because he’s read about the community on a lot of blogs and trusts that it is a quality experience. Over time, he develops karma and improves his reputation so other members trust him. Doug’s dad rides a Harley Davidson and he’s gotten to know some of the other members of the community. When he ultimately becomes a leader and starts organizing rides, the community develops a great deal of trust in him. The member takes action to participate in the community. You can’t have a community without participation. Members must take action to move a community forward. Participating doesn’t necessarily mean the member has to create content. Just consuming is a form of participation too. 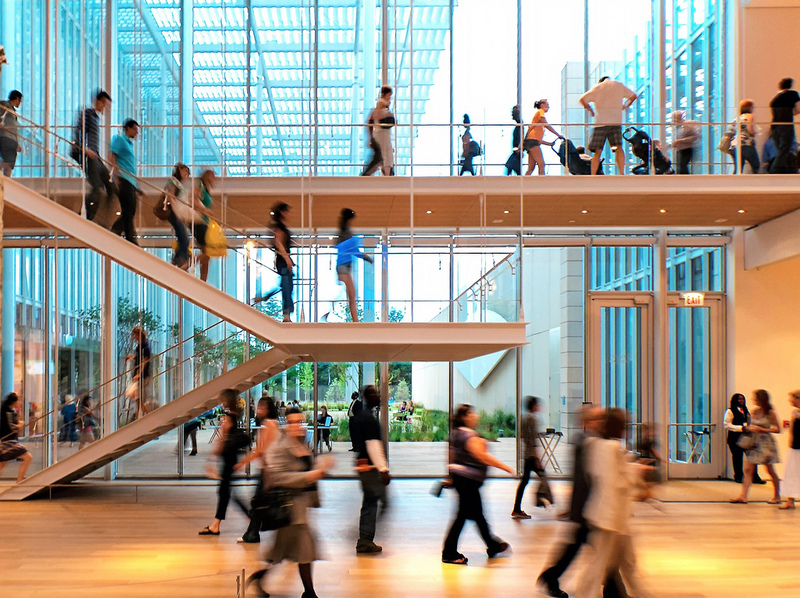 As a member becomes more engaged, they’ll take actions that require greater effort. 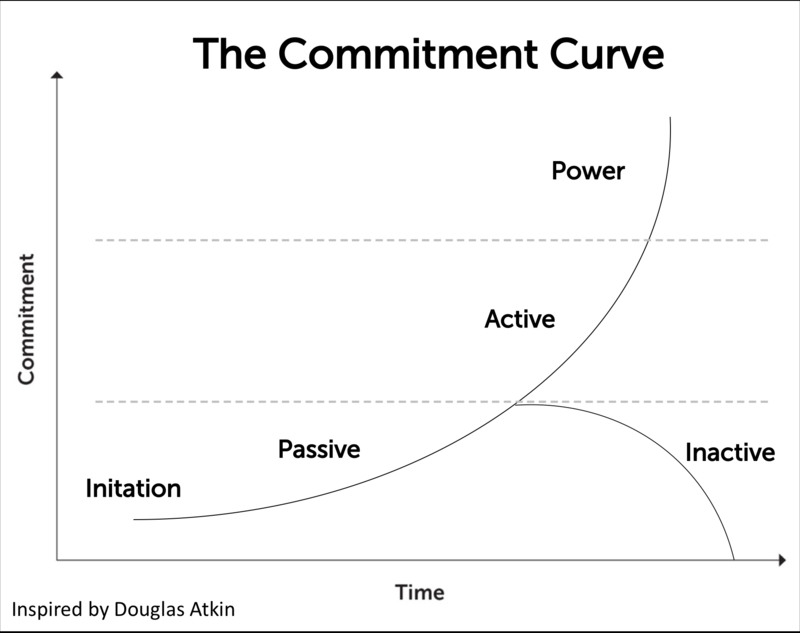 To better understand this concept, we use something called “The Commitment Curve” which was popularized in community by Douglas Atkin when he was leading community at Meetup. He then went on to use this same concept as the community lead at Airbnb. The concept is simple: Over time, a member’s level of commitment goes up, and in turn, so does their level of actions. Early on, members are taking low-effort actions, just consuming. Eventually, they move up the curve, and they take high-effort actions. This is how we visualize the three levels of commitment described earlier. One important caveat here: Members can, and often will, skip around on this timeline. They might jump ahead to be an active member right away. They will also fall back down the curve if you aren’t efficiently driving one of the four stages of the engagement cycle. Arielle first joins Yelp and for a while, she just searches for restaurants and reads reviews. Over time, she starts taking greater and greater actions, like commenting on reviews, writing her own reviews and eventually becoming a Yelp Elite member who writes reviews regularly and takes part in Elite events. Bart first signs up for Reddit and starts to read the posts and comments that other users are creating in the environmentalism subreddit. Over time, he starts to write his own comments and creates new posts. Eventually, he decides he’s ready to participate as a moderator and creates a new subreddit for deforestation. Doug initially gets interested in Harley Davidson and starts to look up pictures online and read blogs and magazines about the community. Then he takes the action of actually buying a bike and going to biker bars where other Harley owners spend time. Finally, he decides to become a leader and starts organizing new experiences for the community. The member gets value from their participation and wants to experience it again. The reward is the last stage of an engagement cycle. It’s a critical step because rewards release dopamine in our body, telling our brain that it was a good experience and makes us want to participate again. That’s why it’s a cycle, the reward reinforces the sense of identity we have in the community, which makes us trust it more, which drives us to take greater actions with greater rewards. Ideally, you always want to have some aspect of social norms in your community. If someone is purely participating for an extrinsic reward, then you are not developing the fabric of community because they’re just doing it for the reward, not because of the people. As soon as the extrinsic reward is taken away or becomes less valuable, the participation disappears. Typically, a community is providing both intrinsic and extrinsic rewards. The member is getting some sort of extrinsic value out of participating like advancing their career, perks, swag, etc. but they also feel a sense of belonging and care about improving their reputation. Arielle first starts using Yelp to find great restaurant and bars. Every time she finds a great one and her friends are impressed, she gets an extrinsic reward (finding the restaurant) and intrinsic reward (improving her reputation as a tastemaker amongst her friends). When she becomes a Yelp Elite member, she gets more rewards like swag and invites to events, but also feels a sense of importance as a leader in the community. Bart develops a habit of coming back to reddit because every time he does, he finds an interesting piece of content to read. Once he starts participating in the community, he starts to feel rewarded for his contributions through the karma he receives (a score that reddit provides providing extrinsic reward) and the feeling of respect he earns as a quality contributor. Eventually as a moderator, he feels a great pride in his role and is also given more authority and tools in the community. Doug enjoys reading about Harley motorcycles and gets a lot of valuable information from the community. Once he gets his bike, he feels a pride and sense of belonging as a member of the community. Eventually, as a leader, he earns the respect of the community which is the greatest reward of all. So there’s the model, which gives you a clear idea of how a community is formed based on the experience of a member. Now how do you use this model to build your own thriving community? The first step is to apply this model to your community. 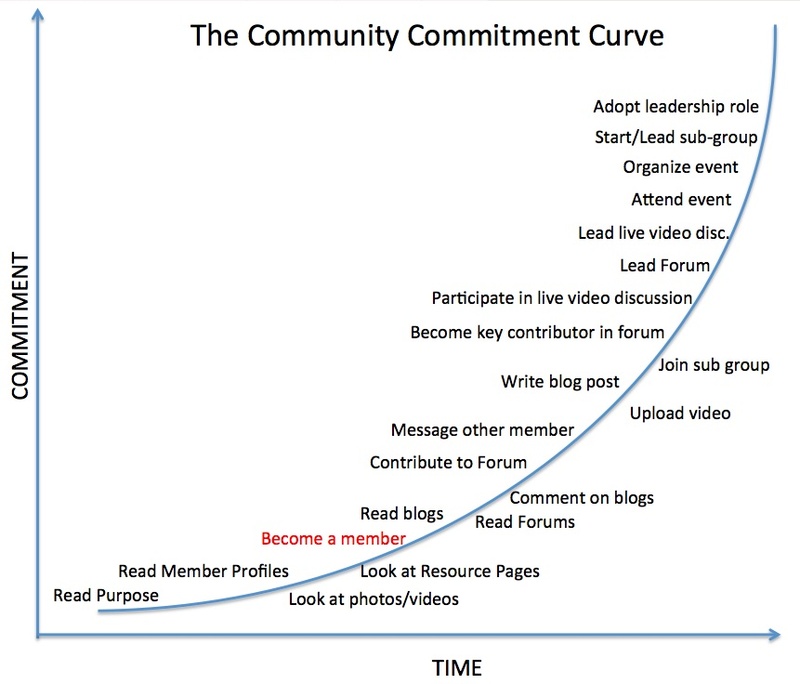 Lay out every stage that your community member will go through as they’re initiated into your community, and then move through each level of commitment. 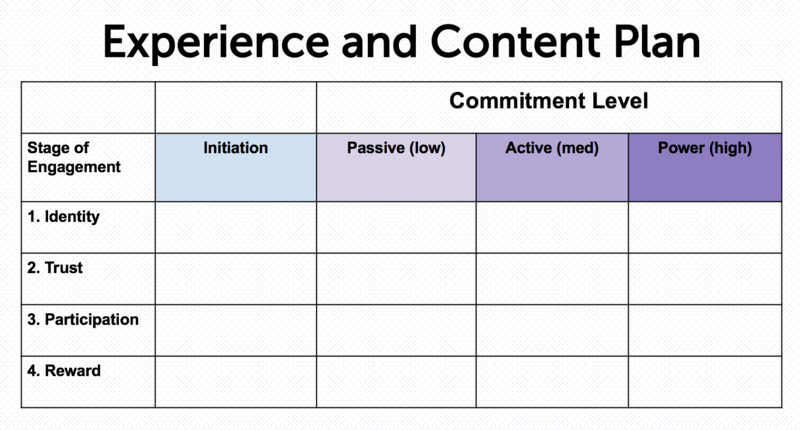 Once you have the full experience laid out, you can then fill out the table again and in each box, describe the content and programming that your team will create in order to define and fuel that experience for the member. This model will help simplify for you and your team what it means to build a community. This way you won’t just be creating content, hosting events, and doing all this work without truly understanding how it all fits together. This is the framework we use to help businesses make sense of it all and put a clear content and programming plan in place. Hopefully it helps you do the same. This was a very high-level overview of the model and is just one piece of a full community strategy. 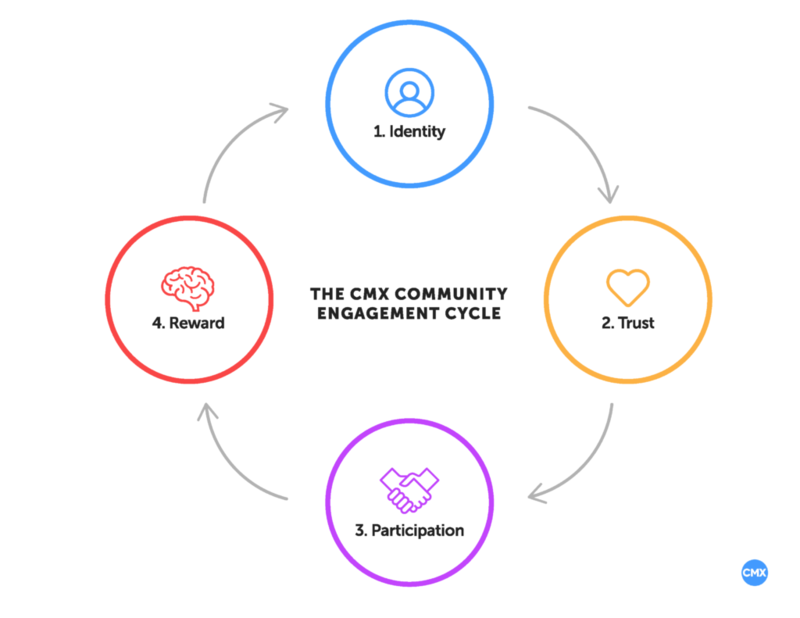 If you’re interested in digging deeper into this model and learning how it all fits into a full community strategy, join us in the next CMX Training program.